There was a department store in Seven Sisters Road very close to the junction with Hornsey road, (just round the corner from the baths) which I think was a fairly early casualty, I seem to remember the building was fairly modern, but the name escapes me, anyone know ? Just the other side of the junction with Hornsey Road I believe there was a club of ill repute where a policeman got shot sometime in the 'fifties anyone shed a light? That was The North London drapery Stores. My Dad was the credit manager there. Me and Mickey O'Donnell worked in there on Saturdays in the curtain dept. Yes I can remember it just round the corner from the baths; I can't remember the name of the store but I do remember the name of the clothes shop that stood on the corner of Hornsey Rd & Seven Sisters Road: John Collier ( The window to watch ). Maybe it was The North London Drapery stores? I just realised where the Drapery stores were. I pass by it at least once a week, when I come down to London and do the shopping for Soulla's parents. Their flat is just down the road from there. The left corner shop below is now a pound shop. I remember in the late sixties part of the store below was where you redeemed your green shield stamps; remember them? Green Shield (and other) trading stamps were very popular. We had books full of them in readiness for redeeming at the Seven Sisters Road outlet. Great memories. Great memories of using green shield stamps! Wife and I saved up for kettles, irons, ironing boards and other stuff! The company still exists as Argos! No stamps these days... but nectar points, air miles and the many and various hotel and travel companies still keep the spirit going!! Am I wrong but was there not a Gamages also at Old Street or was this another store? I can remember going after school to see the model train display with some mates from Barnsbury. There was another large department store very close to Old Street in City Road, I think it stood on the corner where City Road meets East Road. It was called Dawsons. There used to be another called Dudley's in Kingsland Road, and of course not forgetting good old Jones Brothers in Holloway Road. Dawson's store was another renowned department store in North London. My grandma, who worked at the Initial Towel Company in Goswell Road, often went there after work. Also it wasn't far from Moorfields Eye Hospital; so a trip on the 611 or 609 trolleybus would get you there from Highbury Corner. Found the pictures of Finsbury Park very interesting as I used to live in Blackstock Road, very close to all the venues. My dad who ran a shop used to put a poster up every week for the Empire and for this we were rewarded two complementary tickets for first house on Wednesday. The first time (and I think the only time) I went to the Astoria I remember being amazed at it. Some years later when it was The Rainbow I saw the Stax/Volt stageshow with Otis Redding, Booker T etc:; but even in its Astoria days it did the occasional stage show. The Gaumont showed the first feature film I ever saw "The Lady & The Tramp.” I remember the very long entrance hall. As a matter of interest next door was the City Pram Shop, who as a sideline did Triang model railways which were always displayed at the bottom of the right hand window. I had my first OO train set from there. Snap Mickey, "The Lady & The Tramp" was my first film as well, seen at the cinema in New North road which was derelict for years and now sadly gone. I worked at 'Kay's Laboratories' in Gillespie Road not far from where you lived. Thanks for that info Michael. Following on from the Gamages/Dawsons theme, I wonder if there are any naughty GOBBS out there who remember Ellisdons, which was just down the road from Gamages, but on the other side of the road, I know we had the joke/magic shop in Upper Street almost opposite the old cinema, but Ellisdons was the ultimate in that sort of stuff, I remember they had wooden rickety stairs on the way up and the place was stuffed to the rafters with tricks for naughty schoolboys. Also do any GOBBS remember Headquarters & General Supplies, I think that was the name of it, just along the road from Gamages, on the same side going towards the west end. They sold army surplus stuff, not the old water bottles and tin mugs like in our local Army Surplus shops, (did Chris Farlowe have one at the Angel? ), they had stuff like high powered binoculars and radios, some of the stuff was from Russia I believe, not surprised if you could by a rocket launcher, oh happy days! Interesting all the recent talk about Dawsons, Moorfields, Ironmonger Row Baths, and others. Brought back many memories as I lived till 1975 right in the middle of these places. My mother worked in Initial Towel company in Goswell Road as did another member’s grandma. A little way down from the Initial was Moreland street, where I went to junior school with Paul Tully. Opposite the school was Gordon's Gin Building which is still there today, but gin distillery moved out many years ago. Looking on Wikipedia about Gordon's gives plenty of information but one thing missing which maybe our sleuths can find some information on ..... In the early 60's Gordon’s made a cherry brandy which seems to be ignored in information about the factory, possibly because it was export only. Be nice to know more about it as I own a bottle of said cherry brandy and it has never been opened. If I can find way of putting photo on email on iPad I will post it for interest. Going on, Moreland Street School at the time was one of the top schools in Finsbury for swimming trophies. We all had to go swimming, and Ironmonger Row was our pool. There was never the excuse that you forgot your trunks or towel as the baths hired out trunks and towels, not sure if they were only pool to do that. About the baths, they were about 100 yards from where I lived and in those days they had Turkish baths and normal baths, as many homes in that area of Finsbury never had baths. From what I remember the high board at that time was reported to be one of highest in London, and the pool was supposed to be competition size although I never checked if those facts were correct. The pool was 12ft at the deep end. On some pictures supplied you can see pool, boards and side gallery while at the other end was another gallery with cafe at the top and this is where I used to get a nice plate of beans on toast after swimming. Below this gallery was another pool, enclosed for toddlers. At side of the baths was ‘toffee park’ [presume name was a soubriquet - ed] which went down to Old Street, while at the bottom of the park was St Luke's Church which closed down and as far as I know is still the home of the London Symphony Orchestra. Across the road is Whitecross Street where the 1963 film starring Joe Brown and the Bruvvers was filmed called "What a Crazy World". [Dad’s gone down the dog track… ed] Moorfields eye hospital enlarged it's area and now has part of its training area in Bath street. Radnor street joins Bath street and Ironmonger Row and Radnor Street is where I lived and my mother lived till her departure a few years ago. Where Bath Street meets City Road, opposite is Shepherdess Walk, where the pub The Eagle still stands. Who remembers the tune ... Up and down the City Road in and out The Eagle that's the way the money goes, pop goes the weasel. Used to know what weasel related to but forgotten over time. Next door to the Eagle pub there was a yard where my grandfather used to hire out bikes in the 50's. If you go along the City Road towards the Angel, just over the canal bridge used to be Players cigarette factory. Where I used to get bus to school. At bottom of Ironmonger Row was Lever Street, where I used to live before moving to flats in Radnor Street. Along Lever Street was another cigarette factory which was converted to the city hotel. The area has changed drastically over the years, but a lot of the old buildings retain the original architecture. Nearby the former Dawsons is Ironmonger Row and its swimming baths. These have now been refurbished after two years of closure and are gleamingly new and sparkling. In the basement is a 'spa' (sauna and jacuzzi) where you can get various massage type treatments. As an OAP and Islington resident you get a massive discount. You may have met Frank Clark an old GoBB who was around in those days - he was very good swimmer. His family lived off the Essex Road. He and Tom Clift were members of the Clissold swimming club. Streets with a Story: Islington by Eric Willats. Almeida Street. Appears in the rate book for 1838 as Wellington Street. Renamed Almeida Street in 1890. Almeida, on the border of Spain and Portugal was the scene of a battle, part of Wellington's campaign in the Spanish Peninsular War, 1811. Almeida Terrace (site of the theatre) was originally the Islington Literary & Scientific Inst., founded in 1832. It had a reading room 36 feet long and a theatre to accommodate 550. By 1890 the Sally Army owned it - until 1956 when 'Beck's Carnival Novelties' bought it. 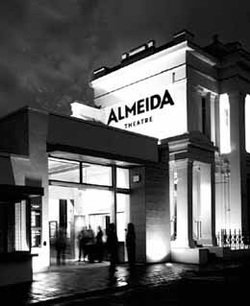 In 1980 it became the Almeida Theatre. Ed.